Hedgehog Home | Habitat | Kids VT - small people, big ideas! 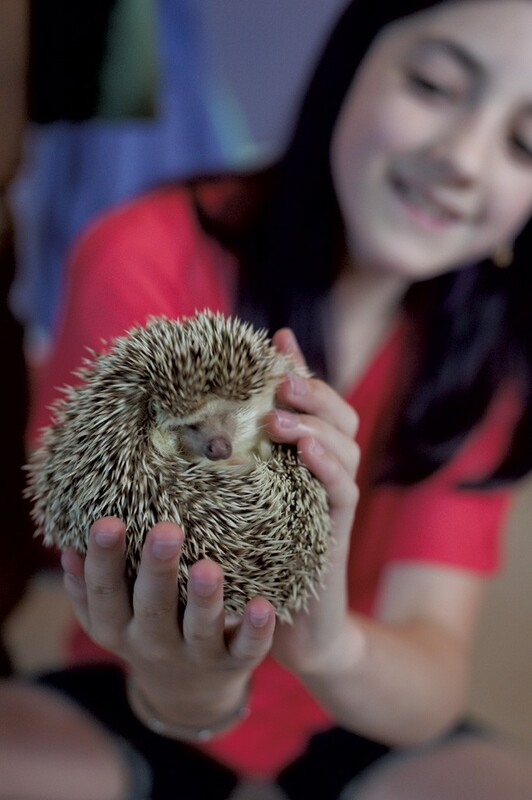 Hedgehogs aren't the fuzziest of pets, but that's why Livia Ball likes them. The Essex Junction middle schooler got one in December for her 12th birthday. She named him Bilbo, after The Hobbit's Bilbo Baggins. "He's pretty prickly on the top," she says, "but he's really soft on his belly." Before her parents agreed to let her have a hedgehog, Livia spent a full year researching these small, nocturnal African animals and how to care for them — she found a lot of tips on YouTube. Livia has since made Bilbo a home in her room, which includes a small house that she crafted out of cardboard and felt, a heat lamp above his cage and a heating pad under his bedding to keep him toasty. Hedgehogs like it warm — if it drops below 75 degrees in there, he'll go into hibernation mode. Livia takes Bilbo out of his cage daily, nestled in a towel. It provides him a dark place if he wants to hide, and keeps his quills from poking her. Though hedgehogs are often described as being too prickly to pet, Bilbo's quills are surprisingly soft when you stroke them in the right direction: head to tail. They also fall out periodically — Livia collects them in a small container. Bilbo has pointy little teeth, but Livia says he has only nipped her a couple of times, when he was afraid. Her prickly pet "isn't that hard to take care of," says Livia. "He can be grumpy sometimes," she concedes, probably because he doesn't naturally like to be awake during the day, but "other than that, he is pretty fun." Livia made the base of Bilbo's cage using connected metal storage cubes from Bed Bath & Beyond. Vinyl flooring lines the sides and bottom. Remember to protect your hedgehog from other pets: Livia placed an extra shelf on top of Bilbo's cage to keep her two cats out. Hedgehogs need a dark, sheltered place to sleep during the day since they are awake at night. Put a wheel in the cage for exercise. There aren't many hedgehog breeders in Vermont, so you might have to travel out of state to buy one. Livia got Bilbo in New Hampshire.